It has been several months since I’ve played in any form of “competition” and a year since I’ve played in a competition spread over two day weekend. However, last weekend I headed down to Conquest, an annual convention held here in Christchurch, for a weekend of gaming. These days I really don’t cope well with “serious” gamers. You know those people that argue over every point and have the social skills of a bulldog. I just don’t enjoy such games. Its probably the reason that I organise much of my gaming around social events at the end of the week or scenarios developed using various systems these days. However I do enjoy DBA. The games are short and the players I generally find using the rules are relaxed. 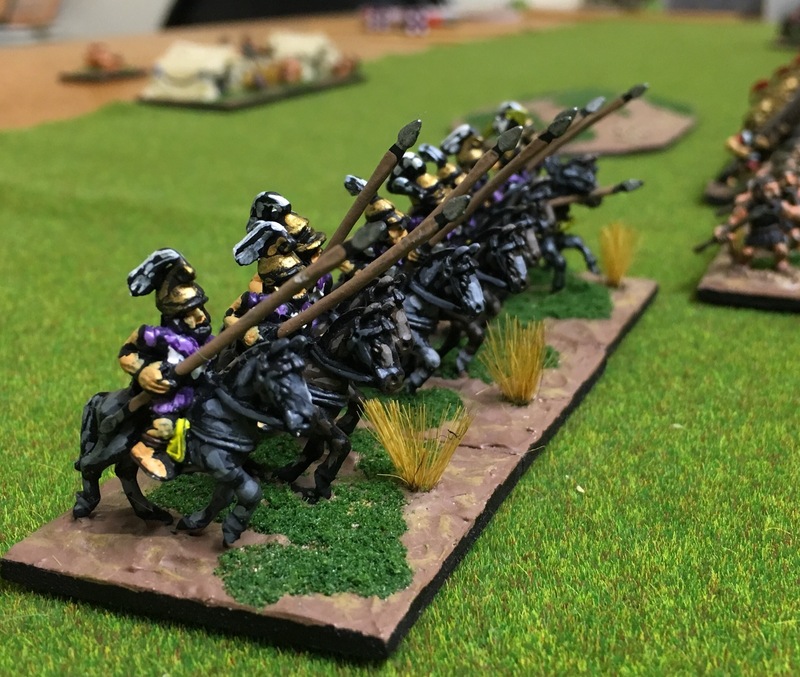 There is little focus on players fine tuning their armies for the perfect tournament play. This year’s DBA competition comprised three different sections which required armies to be changed which resulted in increased variety. As to the number of games played, well over the course of the two days I managed six DBA games and three BBDBA games against six different players while using three different armies. Each game provided plenty of challenges mixed with the tension of problems to solve and dice that wouldn’t behave – an excellent outcome! A short summary of the format, the results and a few photos can be found here. Over the weekend several locals and and four visitors gathered for a DBA competition held as part of the larger Conquest convention. As always I’m appreciative of all the organising that goes on behind the scene. Organising venues, gathering registration fees, organising prizes and the setup and take down of all the tables. Generally the games being played at Conquest were the various fantasy and science fiction systems. I believe DBA was the only historical competition at the venue, attracting a number of visitors. Even more surprising was the lack of demonstration games, usually a feature of Conquest. Likely all a result of the change of venue and reduced space. From a DBA perspective the event was a success, at least based on player feedback. A solid ten players turned up for the first day competition that comprised six rounds of games. I must say I rather enjoy the splitting of the day into an Ancient theme followed by a Dark Age and Medieval theme as it encourages a greater mix of armies. The second day comprised a three rounds Big Battle DBA competition. This too seemed successful though it attracted eight players rather than the previous ten. This format was a bit of an experiment, yet proved popular with all the participants. 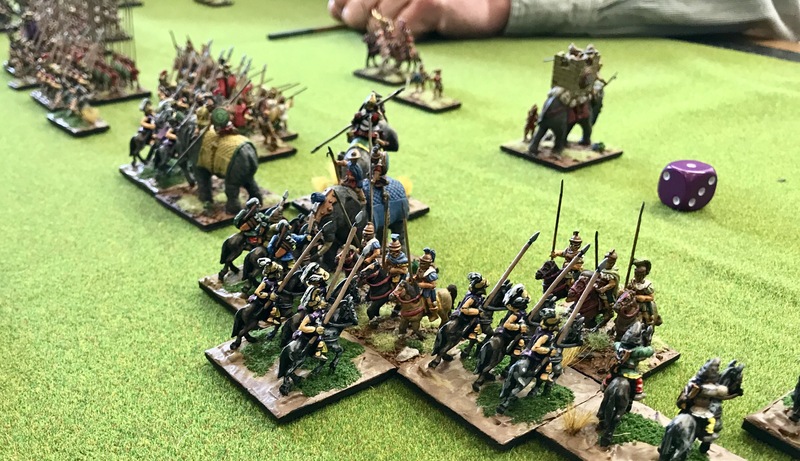 A few photos of the DBA events, including some of the excellently presented armies can be found here. Last night we managed another Big Battle DBA game. As I mentioned previously I was particularly interested as it came just two days after a 300 point game of DBMM creating an opportunity to compare the two rule sets. In addition, as we used similar armies, both based on Hellenic Successor states, comparing the two games was even easier. As to the specific armies, for this latest encounter I deployed a Lysimachid Successor army while my opponent deployed Graeco-Indians. Both armies of course had a core of phalangites and similar mix of supporting troops to our MM game. That said there were some differences as the DBMM lists allow more army composition while DBA armies are generally more restrictive. The Lysimachus was determined to be the invader, and invading Bactria. We used a slightly modified deployment system with the players recording the relationship of commands to each other after camps were placed but before any troops were placed. 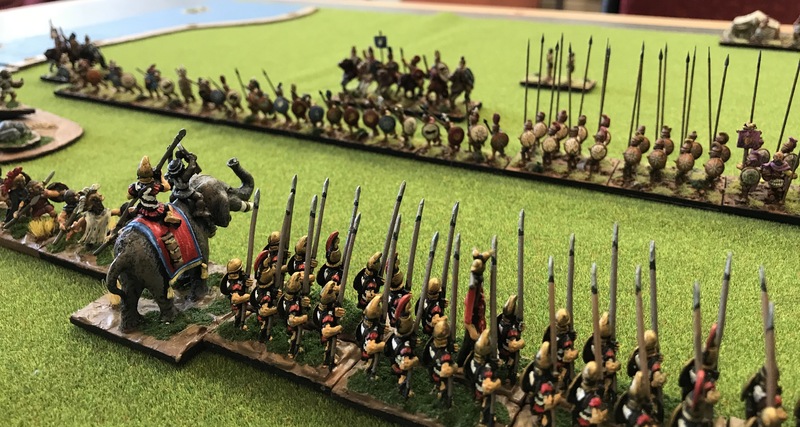 The armies deployed symmetrically with heavy foot in the centre and cavalry on each wing, but the Bactrians maintained an advantage in cavalry and elephants, the Lysimachid in heavy foot. The battle started with the Bactrians, not surprisingly, sweeping forward against the Lysimachid right flank with their Iranian lancers destroying all before them. However, before they could exploit the success the centre and other wings were engaged. On the Lysimachid left the advancing Thracians and Greek hoplites overcome the Bactrian foot and mounted breaking the Bactrian right flank. A factor here was the smaller Bactrian wing and the higher PIP allocation to the Lysimachid left flank. Meanwhile the clash continued in the centre. Here, Graeco-Bactrian elephants caused much disorder to friends and foe alike while phalangites pressed forward, each army ebbing and flowing. It was in the centre that the second Graeco-Bactrian general fell, a casualty to the Lysimachid silver shields who surged forward. Yet it was too much, while both armies were nearing exhaustion the Lysimachid centre finally buckled. With it the Lysimachid army broke. So how did the two games compare. DBMM, without doubt has much greater detail, but this detail comes at a cost of increased complexity. I feel the same aspects are modelled adequtely in DBA. Let’s consider some examples. The Graeco-Bactrian thureophoroi were still superior in combat to the Thracian auxilia and the Bactrian horse still outnumbered the Lysimachids with deadly results. Psiloi played an important part in front of the main phalanx. They disrupted enemy main line or attempted to counter elephants. Yet, they eventually retired through the lines as the phalangites pressed their attacks, just as in DBMM. Then there is the phalangites who swirled back and forth for some time each gaining an advantage, but nothing massive, with the possible exception of the loss of a Graeco-Bactrian general and on the flank of the Lysimachid phalanx which was eventually turned. As casualties mounted command break and demoralisation set in, just as with DBMM. As commands broke commanders struggled to find troops to exploiting success. From my perspective it was an outstanding game. From turn one I was on the edge of my seat. Clearly out deployed, my army seemed doomed but the game evened out and soon the Graeco-Bactrian commander, who had victory in his grasp one moment was starting to consider defeat as a real possibility. DBMM has some real strengths, certainly it has significant detail which can be ideal for players seeking this. I will occasionally play DBMM, but the rules are more complex. In contrast the larger DBA 3.0 games capture enough extra challenges and provide further visual spectacle for those players seeking that. I think BBDBA will work well in historical settings which is my main interest, but less well in a competition. 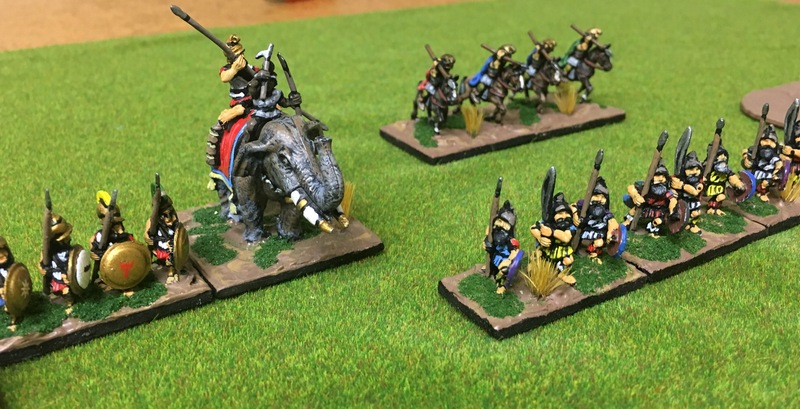 I don’t see BBDBA replacing standard DBA which remains my preferred Ancients game. However, I can see it supplementing it. Of course your requirements or preferences may be different. Either way, we are spoilt for choice.